A 60-year-old Eastbury widow who was hospitalised and recently discharged has now opened up about her brutal beating at the hands of her 44-year-old tenant and in full view of the woman’s two-year-old grandson on New Year’s Eve. The suspect fled thereafter, taking approximately R3 500 cash from the victim’s drawer. 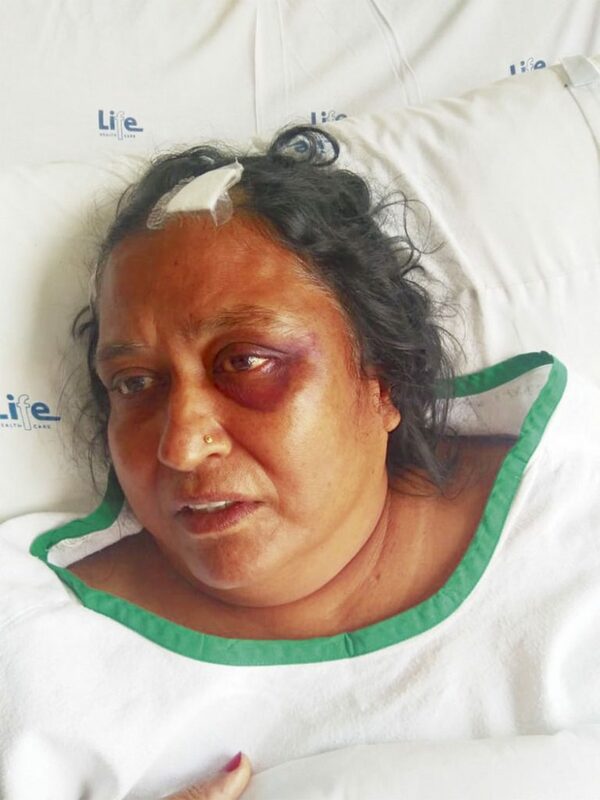 Home industry entrepreneur, Bina Ramdharie, is still haunted by the attack on her by her tenant, known as Brenda and the injured grandmother is making a slow and steady recovery following the brutal beating she received at the hands of the woman she considered as her family. Speaking to The Phoenix Tabloid, the traumatised gran said she cannot believe how her tenant whom she opened her heart and home to, turned to such violence and brutality because of her greed for money. “I was preparing to go to my sister’s house to ring in the New Year. I was packing my stuff and getting ready when Brenda appeared with her two-year-old grandson. The entire morning, she was in and out of my house for no reason. I saw her leave something by my stove and when I questioned her she showed me the rolling pin in a packet. She said that her grandson had hidden it there. Thereafter, she acted very suspiciously. She entered the kitchen and saw the money that I had left on the counter for my India pilgrimage. I quickly covered it. She came up with ruses saying she saw insects in the room and I should go spray it. When I didn’t pay much attention to all her stories, she eventually offered to give me a head and shoulder massage while I waited for her son to bring the rent money. That’s when the ordeal began to unfold,” said Bina. “Brenda told me to lie on the bed and then suddenly started massaging me with the rolling pin. I was surprised to find her using that. She said it was old school massage. Then she became rough with it and I told her she was hurting me and I got off the bed. Thereafter, she again said there was an insect that ran in to my room and I should go spray it as it could bite. I followed her suggestion and turned my back to do that when she booted me from behind. I was stunned. I fell and she started beating me with the rolling pin. I was so shocked. All I kept asking her was why she was doing this. I screamed for help as I knew that Brenda’s parents were in the outbuilding. ‘I want your money’ she said. “I told her to go to the car and take the money from the boot. She said she was going to take the money and kill me too. As I was on the floor, she kicked me and continued the assault whilst her grandson stood and watched and screamed in horror,” said an emotional Bina. “A bloodied Bina said she managed to hold on to the little boy and pick herself up, at which point, her assailant then took out a ripcord from her brassiere and wrapped it twice around the grandmother’s neck and pulled tightly on it. “I struggled to breathe, tried to stop her. I then bit her fingers at the first chance I got. I remember biting her so hard that I felt her bones crush. She felt pain and released me. I ran and pressed the panic button and then ran outside after closing the gate. I screamed for Brenda’s parents who were in the outbuilding and they came out. I also called my neighbour and within minutes people were at my side and the ambulance came as well,” said a traumatised Bina. Bina’s attacker had fled in the commotion, taking R3 500 from a drawer which she knew cash was kept in. The elderly victim was hospitalised and hovered between life and death, taking a while to recuperate. “I trusted Brenda and her family. I allowed them to stay on my property and they barely paid rent. They were in and out of my house and I treated them like family. I cannot believe that she was so greedy for money that she planned to kill me and rob me. I believe that her family knew of her intentions and conveniently did not hear my screams. I have nightmares every day. I am still in pain and making a slow recovery. I urge community members to be careful of placing trust in strangers. Do not allow people into your home and be wary of the kind of people you allow to rent on your property. You could be opening yourself up to danger if you are not sure of the people you accept as tenants,” a distressed Bina said. “Phoenix police are investigating a case of assault GBH and attempted murder, said Phoenix SAPS communications officer,” Cpt L Naidoo. No arrest has been made.